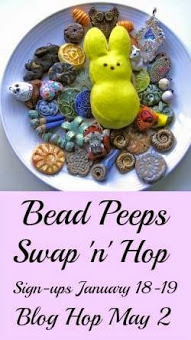 What did I do with all those beautiful beads my bead partner Debbie Davis sent to me? Well, today is the day to bring my soup finished and show it to the three hundred and ninty nine plus members who took part in this bead soup party, like me. Before everything, I bow to our organizer Lori Anderson who had conducted this whole thing and gave us this wonderful opportunity. Few weeks ago my partner Debbie sent me these wonderful beads. I was excited to see the donut shell . I had bought a fantastic tutorial from an amazing wire artist named Donna Spadafore. . You can find this in her Gailavira etsy store. I did not have any donut bead. So I decided to try it here first. I thoroughly enjoyed the challenge, even though you'll see my novice work there. But this is my first try with this complicated design. I knew that I'd use the heishi beads with this shell pendant. But after finishing I am having doubt - probably the shell pendant did not need this extra adornment. It was pretty enough to start with. What do you think? The clasp is so pretty I wanted it to be shown in the front.and I wanted to use the green agate beads she sent with the cute filigree connectors. So, in the beginning this is what I made. It was a long necklace about 30" long. But it kind of missed the oomph! It was too plain. So I broke it and spent a whole afternoon staring as that torn piece. I knew I did not have much time . I grabbed my design journal and started to doodle. How about having chains in one side and something...something on the other? Now something what? Then I found that I had these mini malachite chips that raised their hands to be part of it. I told them I'll think it over, they have some chance as they are green too but can't promise yet. You can see from my diary that I was a bit scared to take this leap. I like asymmetry more than symmetry but then there has to be a rhythm, a balance . I just don't want to be too radical and make it tacky! Still not quite sure until wore it. Not too bad. I can carry this. Oh, I forgot about the earrings. Here they are. I know I'll be using them a lot. 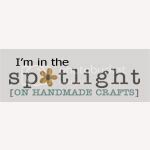 This blog hop was my second one. I enjoyed it intensely and it gave me a chance to take risk and jump out of my usual style, and comfort zone. That is an important part in this journey of being a jewelry artist ( wanna be artist ) I think, with all its agony and ecstasy. Be sure to check out all the other artists who were part of this party world wide and you may find some amazing jewelry that you never saw before. Thank you for dropping by. Your comments will be my treasures. I really like the additional strands you added to the toggle necklace. It gives it some bulk and importance that the first design didn't have. Nice job!! Wow! I love what you did with this. So creative. Completely different than anything I would have come up with. What a great job you did. Kudos! Also you were a fantastic partner. It was great getting to know you a little. How very clever with the clasp! Adding the dangles was perfect! Terrific job. The shell necklace is perfectly fine! The heishi beads work, don't worry :-). I like how you were willing to take apart the second necklace and re work it - I think either piece would have worked, and they are both beautiful. But the new, reinvented necklace is more unique design I feel, and is rather striking. Love the little green earrings too. Lovely pieces! The first necklace is beautiful! 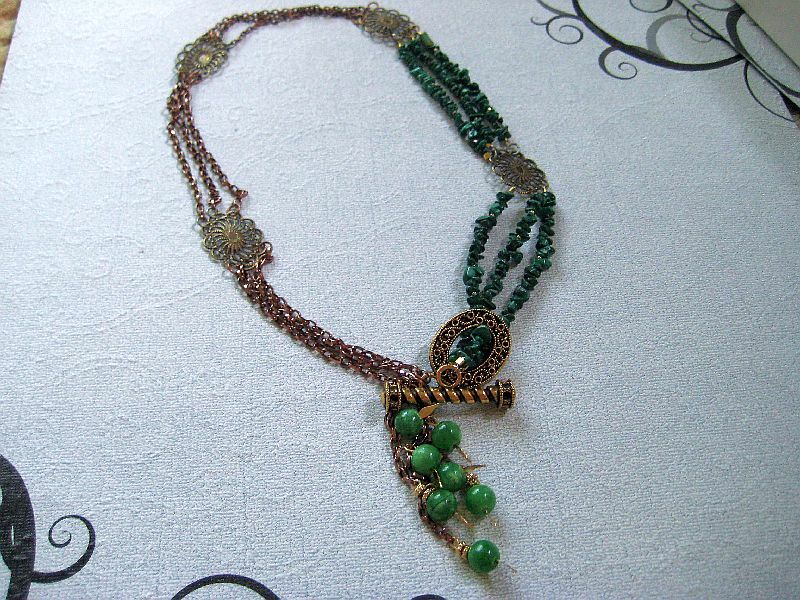 I just love what you did with the second necklace. It is very stunning. I really like what you did to all the focal areas. Great work! I LOVE your pieces! You total took the beads given to you to whole new level. The first piece with the donut focal is beautiful! I love what u did to the donut. I couldn't tell you were a novice. The second piece is my favorite. I love the asymmetrical necklace and really like how u put everything together with the toggle at the side. The additional strands really looked so much nicer. WOW! That necklace looks great around your neck. Wow! 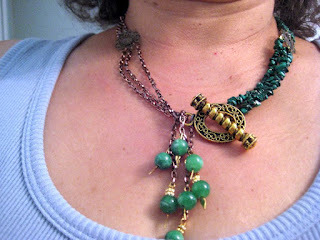 I love that malachite necklace. I really like jewelry with complex construction and that one is a home run. Love it. Great job! Glad you made the jump to try something new. I think it turned out beautiful. I love the second necklace, great solution you find! really good job. also first necklace is beautiful! Great pieces -congratulations on trying new things with beautiful results! Good job on your asymmetrical necklace. It looks kool on you. I think that the malachite chips added a lot. Loved the fact that you tried new techniques. I think the third necklace really worked. the shell donut necklace is absolutely beautiful.. i simply love the colours of that piece... and i think the second round of the toggle clasp necklace was a complete success!! Both necklaces are lovely. I love the detail of the embellishment you created! I think the heishi beads work fine with the donut. Beautiful, especially since it's the first time you did this. I love your pieces! Wow, I am impressed that you broke down the necklace and recreated it... I like both of them, but clearly the new design was meant to be! Super fun blog hop!! Sometimes wearingit is the only way to know for sure. Great job! Great job. Loved the insight into your design process too! Great soup! I do love the re-work and love how you made the clasp the focal! 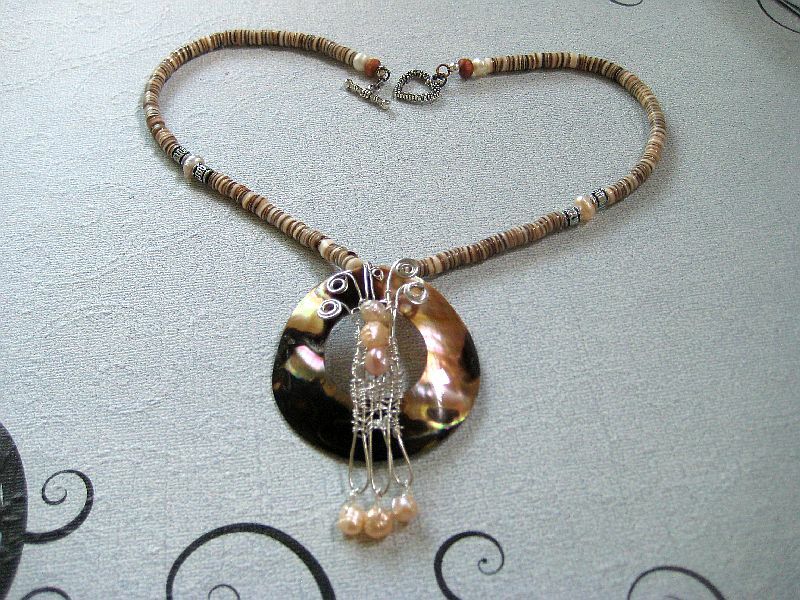 I do like the changes you made to the second necklace, it makes it stand out and get noticed! Those earrings are just too cute! OOhh! I think you nailed it! These look great. I love seeing how brave people have been with the BSBP. Trying so many new techniques. That necklace is amazing. I've used that same toggle a few times and love it! I know it's big but it's perfect. Your earrings are so simple and luxurious - I'd wear them all the time! You did a great job with the asymmetry, it's beautiful, and your first try at that wire work is very good. That's what it's all about, trying new techniques, and you did great! Wow!! You are very creative and I know it's hard when you think you should do something else after you've done the piece!! So many great ideas! thanks for sharing and for visiting my blog and commenting!! Happy Beading! I love that you were brave and it paid off! Wow luv your creativity and your designs! Totally rock out! Luv the added strands to necklace! So way kewl!!! I love what you did with the donut in the first necklace. I have been known to take apart finished necklaces so I thought it was interesting to see the before and after. Actually, I liked the necklace both ways. What lovely things you made the donut is exceptional with the great wire embellishment. definitely love the asymmetrical one! Great pieces!! I love how you made the toggle clasp a feature! Well, you might have had a hard time in the design process, but you did an amazing job!!! I love the use of a toggle as a focal that a cool idea! Beautiful pieces! I love the shell focal!! Wonderful job with your soup. Your pieces are lovely. I really love what you did.. The clasp is awesome. great job.